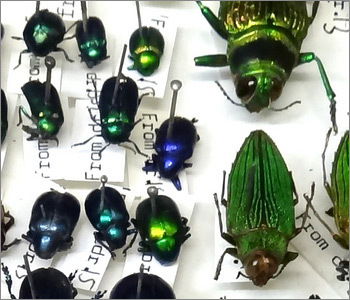 Entomology collections lend themselves to numerous different mounting, preservation and storage methods; and they also vary in these methods dependent upon specific orders of insects. All of these methods not only come with inherent problems but add to that the historicity of the collection and they can become complex to understand and conserve. Generally the methods used in Museum insect collections are dry pinned or mounted, papered, in spirit (ideally 80% IMS by modern standards) or mounted on slides. Pinned collections, which is the most common method of preservation and storage serves for many insect orders such as Coleoptera (beetles), Lepidoptera (butterflies and moths) which will be pinned through the thorax. Some insects can be card mounted or staged. Other orders such as Hymenoptera (bees, wasps, ants) and Diptera (true flies) though in many cases pinned may be pinned differently, for example stuck to the side of a pin. Soft bodied insects such as Arachnida (spiders and other eight-legged arthropods) are usually preserved in Ethanol or IMS (Industrial Methylated Spirit). Other soft-bodied insects such as Lepidoptera may be papered (a method mainly used in the field as a temporary method of storage and transportation). Specimens found on slide mounts are other Orders such as Hemiptera (true bugs). Without curation on at least a care and maintenance basis, entomological collections can deteriorate rapidly. Such horrors as alcohol evaporation of spirit collections, poorly glued specimens (with the 'wrong' type of glue, a collection decimated by a hungry Dermestidae beetle (Anthrenus sp.) or Verdigris damage from copper based pins can render a collection beyond retrieval. Within NatSCA, we have a number of experienced entomologists who can help to provide access to various resources and texts and give practical advice on the subject. You can also find some advice on the care and conservation of entomological collections in our Care and Conservation of Zoological Specimens leaflet. Microscope slides have been used as a method of preservation and microscopic observation for almost 200 years for microstructure of minerals and whole organisms and the microscopic parts of larger organisms. These can be affixed to glass, wood or plastic slides as liquid, solid or dry mounts and can be transparent for through light microscopy or opaque for reflected light. Many different methods have been applied to improve optical quality and in the past glues and mounting media have been considered to be free of deterioration problems but this is not so! Many mounting media which were thought of as being perfect optically are now drying out, shrinking, crystallising and are even eating the specimens! There is an increasing requirement for the conservation of such collections and to understand why glues and mounting media are deteriorating so as to avoid future problems. Thin mounts and sections of a "permanent" nature can be stored vertically and become their own indexed collection. Liquid and thick media mounts would leak or slump under the influence of gravity and must be stored horizontally so storage methods must be correct for the type of slide collection you have.